As a child I remember that desserts such as cakes and pies were always reserved for Sunday dinner. During the week we always had fruit, usually with custard, and I think that's a good tradition to bring back. For those of you with families that are still very addicted to sugar, this is a good way to start weaning them. You can start out putting more sweetener into the custard, then gradually decrease the amount until you are only using about half the regular amount. There will still be lots of sweetness from the fruit so everyone should still be happy, but they will also be retraining their sweet tooth to be satisfied with less. I know some may frown at the thought of dessert every night, but I think you have to be realistic. Eating fruit and custard with a healthy bit of sweetener is far better than having your family fill up on chocolate bars and candy during the day because you're being a food Natzi at home and insisting on strict adherence to the Paleo guidelines. 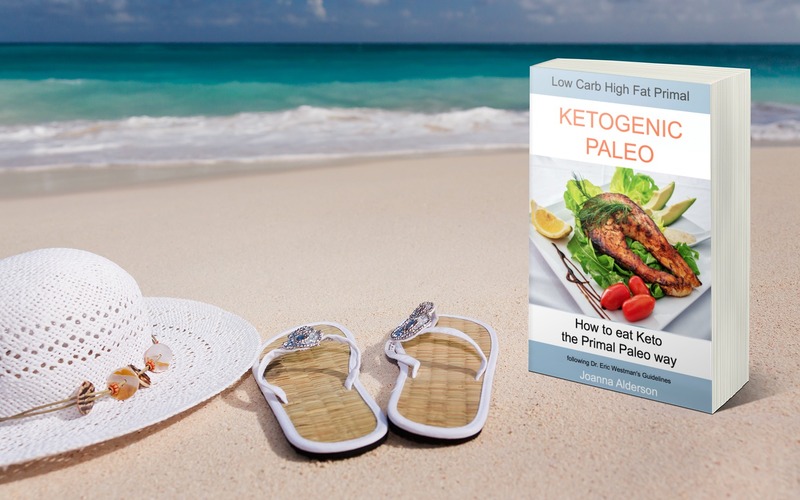 You'll probably achieve your end result of a healthier family much easier doing things this way and you won't feel like you're in a constant fight. 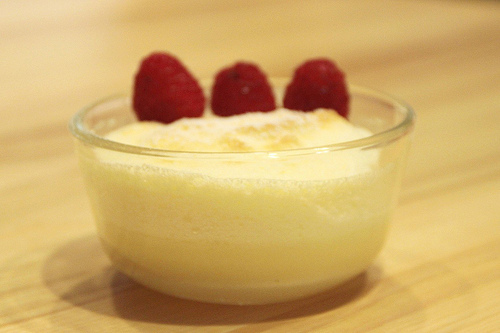 This first recipe is for custard made on the stove. I found it in an old recipe book and I really like it because it's yet another way to get more gelatin in your diet - and as I'm sure you remember from my post, gelatine is fantastic for keeping your skin elastic and therefore youthful. - Combine all the ingredients in a medium sized saucepan and cook over medium heat, whisking continuously to make sure the custard stays smooth and doesn't burn. - Pour into a bowl (preferably one with a lid) and refrigerate. If you don't have a lid, cover with plastic wrap. 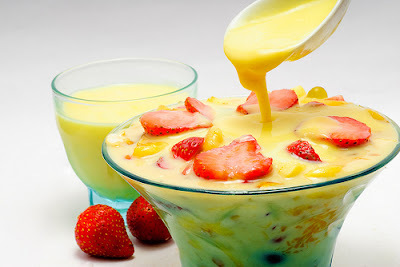 - This custard with get thicker the longer it's in the fridge, so making a batch at the start of the week is a good idea. Then you can use it during the week as needed. 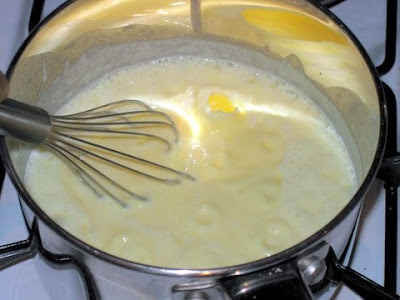 Note : If you find your custard hasn't mixed smoothly and there are lumps or bits of egg, just pour it through a metal sieve before you refrigerate it. Add 2 tablespoons of cocoa to the rest of the ingredients before cooking. Make the same way as chocolate, but instead of the cocoa add 1 teaspoon of lemon flavouring and 1 teaspoon of lemon zest to the custard. You can sprinkle some more lemon zest on top as well. 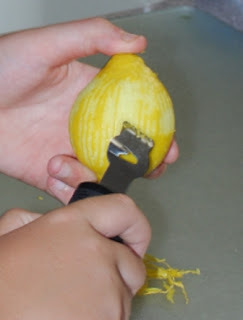 This is just basically grating the rind of the fruit by rubbing the skin against a grating surface. The flavour is in the coloured part so try not to grate any of the white under the top layer. 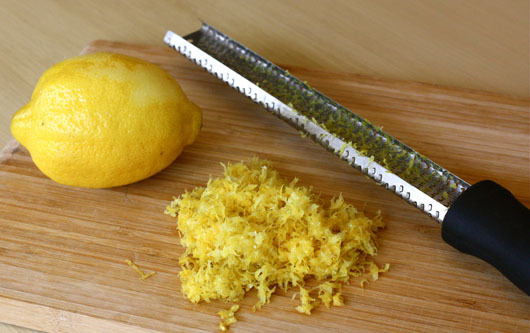 You can do this with a regular grater if you really have to, but it can be tricky and hard on your fingers. 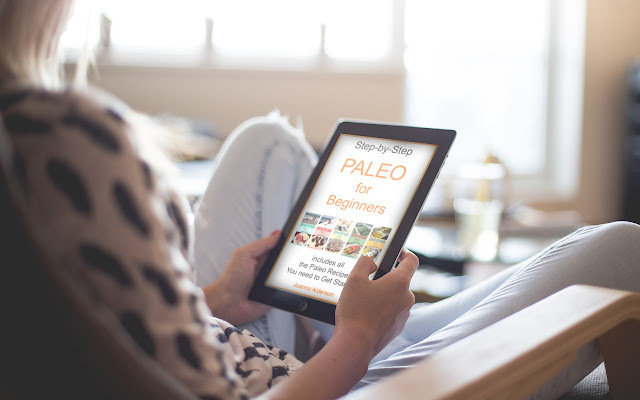 To make this easy, invest in a kitchen grater or zester. 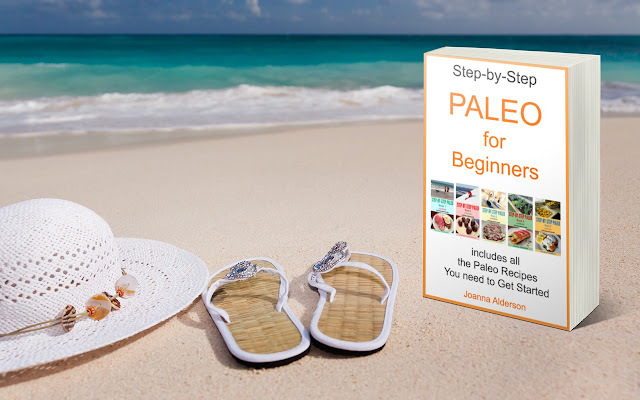 These tools are easy to use, very inexpensive, and will quickly do the job. And since zest of all kinds really adds a lot of flavour to any dish, you will find that you will use this tool a lot in your cooking. 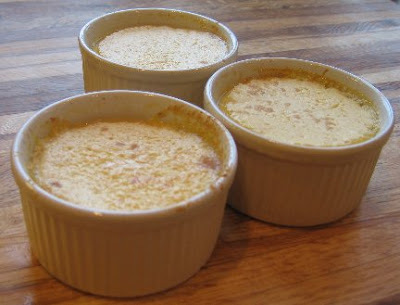 This second version is a baked custard. It's my custard version of the coconut custard pie found at therepressedpastrychef.com Of course his recipe uses a crust, but the basic custard is delicious without it. You can either bake this in a large pie plate or dish or in individual ramekins. 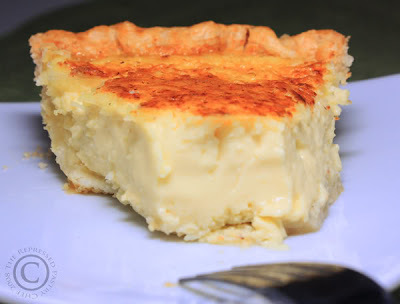 - Use either a pie plate or a casserole dish for baking the custard, and grease it well with a little butter or coconut oil. - In a medium saucepan combine the cream with the coconut milk and heat until it just starts to boil. You have to watch this very carefully. 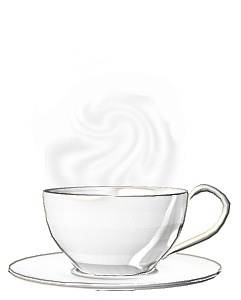 - In a large bowl, whisk together the eggs, sweetener and vanilla. - Now very slowly, whisking continuously, add the hot milk mixture. Watch to make sure the egg mixture is being thoroughly incorporated and doesn't start to "cook". - Pour into the prepared pie plate or dish and bake for 35 minutes. - Reduce the heat to 250'F and bake the custard for another 20 minutes, or until the custard is just about set. It won't be totally firm but you don't want it liquid either. Aim for something in between. - Remove from the oven and cool on a rack. When the custard is just about at room temperature you can put it in your fridge. Chill for at least 2 hours before serving. This was originally made as a coconut custard pie and the original recipe included 1/2 cup of shredded unsweetened coconut. (see the photo above.) If you want a coconut custard, add this to the custard just before pouring it from the pan into your prepared baking dish. 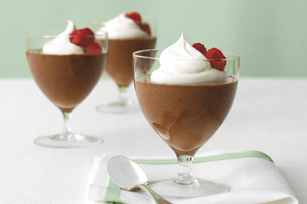 This version has quite a bit of sugar so use it only on special occasions, but it is a terrific dessert for a dinner party, especially since it's easily made ahead of time and can just be served when needed. Melt 1/2 cup of coconut sugar with 2 tablespoons of water and cook over medium heat until it makes a nice dark syrup. (You could use maple syrup, but it won't be as dark and rich tasting.) Pour this into the bottom of your greased baking dish or divide amongst individual ramekins. Then proceed with the custard recipe, pouring the custard onto the caramel. Once the custard has set overnight in the fridge, you can turn it out onto a plate or plates by putting the plate over the dish or ramekin and then inverting it. 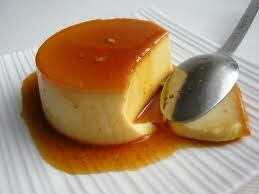 Slowly remove and the custard will have a topping of caramel. There will also probably be caramel sauce so in order not to make a mess I suggest you use small bowls rather than plates for serving. 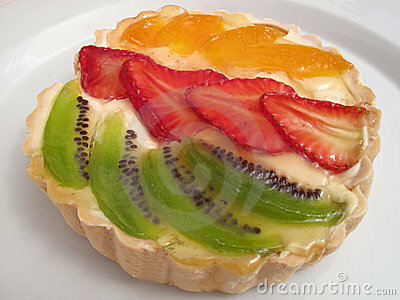 Of course now that you have these recipes, you can easily make a fruit and custard pie for a special dessert. 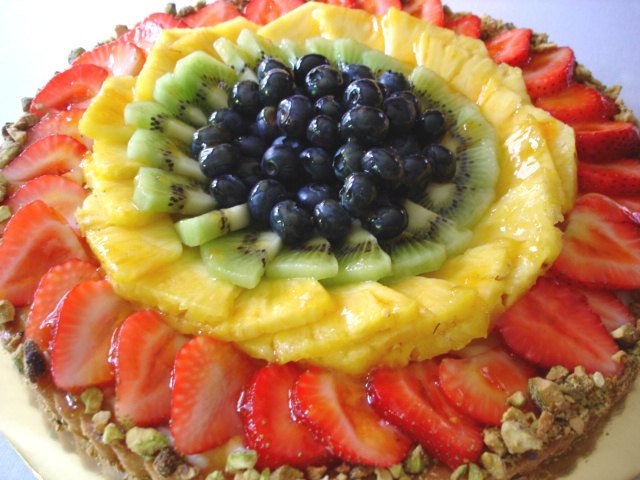 Just use my nut crust recipe, fill it with custard, and top with sliced fruit. If you want you can even add some chopped nuts - delicious and easy! Thank you for the lovely custard recipes, I'm excited to try them. 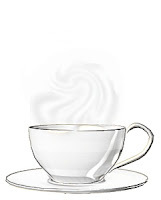 Just one question, how many cups or mls or 1/2 gallon of coconut milk is in the carton you are using? Appreciate all the other useful info. re Paleo. Best, London. The carton I use has about 2 1/2 to 3 cups of coconut milk. With all the egg yolks and gelatine used for thickening you probably have a bit of leeway in the amount you can use, but if your custard doesn't thicken just add a bit more gelatine and see if that helps. Will it still work with canned coconut cream if I can't get the carton version? The milk in the carton is thinner, so if you only have canned try mixing it half and half with water.